Up until the 1960s, Britain’s railway companies had a long and proud association with heraldic devices. This week’s beauty of transport is the story of the unexpected return of heraldry to Britain’s railways, a brilliant piece of graphic design, and one of the greatest bits of PR spin ever spun by a modern transport company. 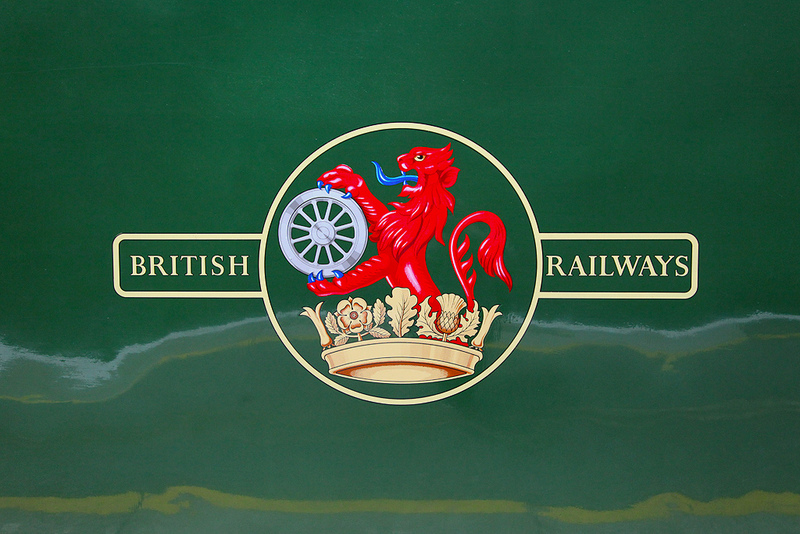 After the introduction of British Rail’s new corporate identity in the 1960s, its crest was replaced by the famous double arrow symbol, and heraldic crests disappeared from the railway. When the railways were privatised in the late 1990s, most of the new private train operators chose modern-looking corporate identities. There was one exception: East Coast Main Line operator GNER (Great North Eastern Railway). 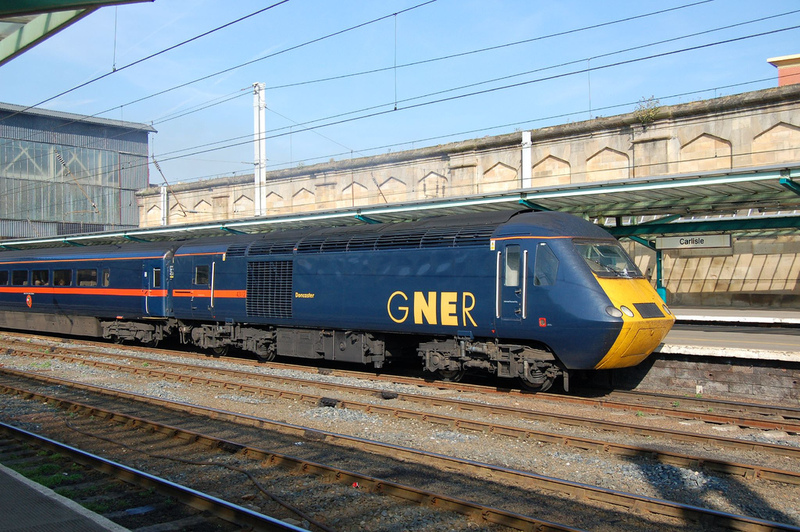 GNER’s abbreviated name already looked a bit like its predecessor LNER’s, and a bit like one of the LNER’s predecessors, GER – the Great Eastern Railway. Its new visual identity was created by American design studio Vignelli Associates and launched in 1997, shortly after GNER took on its new franchise. The visual identity covered train exteriors and interiors, staff uniforms, and printed publicity. GNER’s trains were painted dark blue – the same colour as the Venice-Simplon Orient Express European luxury train operation which was also owned by GNER’s parent company Sea Containers, a transport and freight container company, offset by a red stripe. The lettering for GNER’s logo was in gold. Unveiled to the world in 1997, the most surprising elements of the livery could be found on the outside of GNER’s trains, in the lower middle of the carriages. These were Vignelli’s masterstrokes, the greatest favour it did for its client. Firstly, the trains sported the legend “Route of the Flying Scotsman”, a reference to the famous London-Scotland express train first operated by the LNER. Underneath this were cast metal badges (they might look like crests, but there are lots of rules around heraldry which dictate what coats of arms/crests/badges can or cannot be called) which looked very much like traditional railway company crests. For cost and weight reasons, many trains got the crests as decals rather than cast metal versions, but most passengers wouldn’t have noticed. The GNER badge, designed by Vignelli Associates. By R~P~M [CC BY-NC-ND 2.0] via this flickr page. The GNER badges featured the Lion Rampant of Scotland (on the left) and the Lion Passant which represented England (on the right, although the traditional “Lion of England” faces the viewer rather than having its head in profile). Thistles (the flower of Scotland) and Tudor roses (the flower of England) feature at top and bottom. Both lions hold green pennants/flags, which is the traditional railway signal for a train to depart safely. Where there might traditionally be a crown circling the flowers at the top, instead there is a circlet of railway track, which was a neat touch. I have a feeling that the five white dots on the English lion’s oval, and the two green ones on the Scottish one, represented the major stations served by GNER, but I can’t for the life of me remember the exact explanation. It’s a super piece of design, whatever you think of the way it plays on railway history. The whole exercise was designed to evoke a lost golden era of steam railways, with friendly station porters and train guards dedicated to getting you from station to station in style and comfort. While all the other new private train operators on Britain’s railways were looking forwards, GNER was determinedly looking backwards. Such an approach made GNER the darling of the railway enthusiast community, and allowed it to get away with one of the greatest spins of the early privatisation era, that of GNER’s superior customer service. The historical and heritage elements of GNER’s corporate identity provided a hook on which GNER could hang its claims of the best customer service on the British railway network. 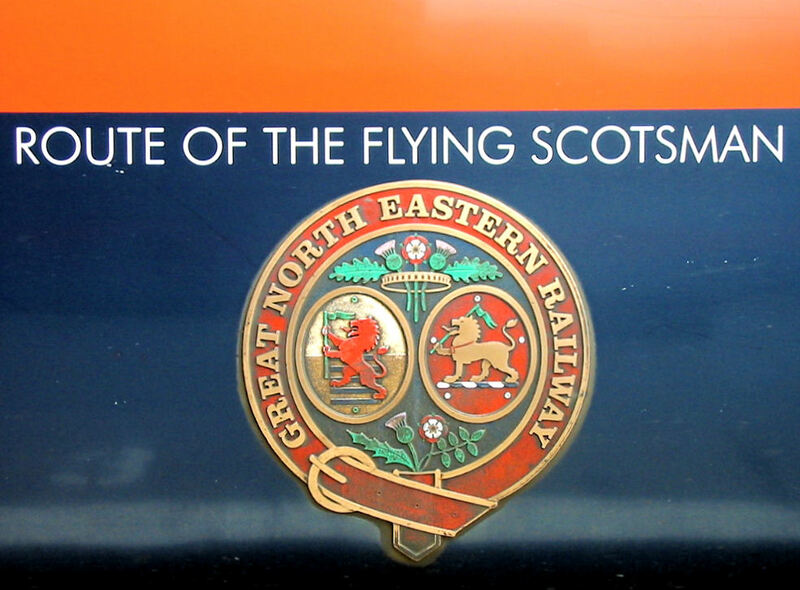 It continually told everyone that it had the best customer service, and with the (larger than you might expect) railway enthusiast community on side thanks to GNER’s association with the Flying Scotsman emblazoned on its trains, and much of the rail industry press on side too, it became one of those truisms of the railway network, regardless of its intrinsic truth. It must be true that GNER had customer service like that in the golden age of railway travel, because its trains look like they come from the golden era of railway travel; they even mention the Flying Scotsman, for heaven’s sake…or so the theory went. That the golden era of railway travel was more or less a figment of the collective imagination was of no matter. Do a quick search of the worldwide web today for “GNER customer service” and you can still easily find examples of media outlets reporting positively on GNER’s customer service. Examples like this one demonstrate that the impression was partly achieved by GNER management telling everyone that it was so. Yet it was a line unthinkingly repeated all over the place. “GNER has thus far delivered a quality customer product which is second to none in the UK,”¹ says Colin Boocock (2001: p13). Yet the situation was more complicated than the prevailing wisdom suggested. For a start, GNER was fortunate in its competitors. There has been intense rivalry between the West Coast and East Coast Main Line routes between London and Scotland since the steam age, though it went more quiet during the nationalised British Rail years. Privatisation meant different operators for each route once more and the rivalry flared up again. While GNER operated on the East Coast route, the West Coast Main Line’s trains were run by Virgin, one of self-made billionaire Richard Branson’s companies. Virgin Trains also operated the Cross Country inter-city network. Having established himself as an anti-establishment figure dedicated to innovative customer service on his Virgin Atlantic airways business in particular, Branson had made himself a figure much of the British media loved to hate, and they were looking for a reason to put the knife in again. Virgin Trains gave them a great excuse. With trains breaking down regularly, and the glamorous experience of Virgin Atlantic less evident in the more mundane surroundings of a train, the media loved to report the travails of Virgin Trains, often comparing the company unfavourably with its rival GNER, which as everyone knew, had unrivalled customer service. There were mutterings in the business media that Virgin Trains was damaging the Virgin brand (which was prominent on its trains as part of a much more modern livery than GNER’s). Virgin Trains was saddled for the most part with ancient and unreliable trains, and although it ordered brand new tilting trains to replace them, inevitably they were going to take several years to arrive. GNER’s trains were considerably more modern. Yet Virgin went to the trouble of immediately starting to replace the seat covers in its trains, despite their imminent withdrawal, whilst GNER did nothing of the sort. Customer service on GNER didn’t extend to the replacement of what became increasingly threadbare and tatty seat covers and carpets in its trains for several years. It was all a bit of puzzle for someone like me, using GNER to visit family in the north of England, but working in the railway trade press, meeting fellow journalists for whom GNER could never do any wrong. It took until a franchise extension before GNER started the process of refurbishing its electric train interiors, which had otherwise remained essentially unchanged from their British Rail days. GNER also had a shocking trend for over-promising initiatives which would improve the customer experience, only for those promises to go unfulfilled. Not to be outdone by its rival Virgin Trains, GNER promised to buy two new tilting trains; images of which can still be found on Vignelli’s website (here) . They never arrived, after GNER realised that buying just two trains was uneconomic, and instead demanded a franchise extension in which to deliver a small fleet of them. Plans for three parkway stations on its route were talked up by GNER (and were even mentioned in Parliament), but none were ever actually built. An electrification scheme near Leeds never happened. GNER blamed open access train operators for preventing it being able to run additional trains, damaging the business case, on that one. In the end, everything went pear-shaped for GNER, shortly into its second full franchise term. Its parent company filed for bankruptcy, and it became clear that the high premiums GNER had pledged to pay the British government for the right to operate the East Coast Main Line route were unaffordable, after revenues fell below expectations. Before long, GNER had handed its franchise back to the government. So GNER ended with a whimper, not a bang. It had created a public perception that it offered the best customer service on the British railway network. That impression was deliverable because of the brilliant corporate identity designed by Vignelli, which had created the image of a company that looked as though it ought to be delivering the best customer service British railway passengers had ever seen, whatever the reality of the situation. As such, it stands as one of the great pieces of modern railway visual design. A perhaps more balanced view of GNER’s record than the one which was generally prevalent at the time can be found in the archives of transport consultancy The TAS Partnership, which noted GNER’s clever marketing, and its failures as well as its successes (the succinct piece is well worth a read, here). …and all the articles/webpages linked to in the text above. There are plenty of photos on the web, but the National Railway Museum in York (UK) has one of the cast badges from the side of a GNER carriage in its collection if you want something a bit more tangible.